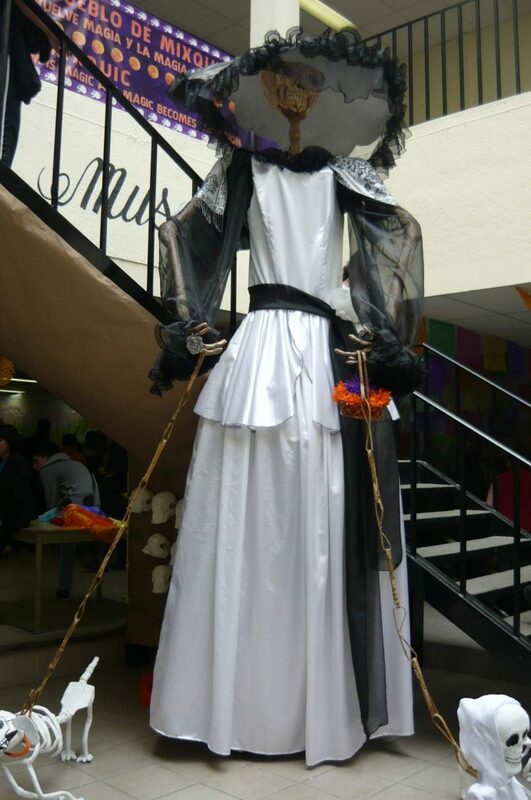 The Day of the Dead in Mixquic is a very rich cultural tradition, full of color and folklore that shows a series of beautiful offerings along with other activities such as theatre, music, expositions, dance, and food. Mixquic is a region that was declared World Heritage by UNESCO. Its origins date back to approximately 670 A.D., it was greatly influenced by diverse cultures such as the Culhuacan, Chalco, Cuitlahuac, Xochimilco, Azcapotzalco and Tenochtitlan lordships, which fought for it since it was a great vegetable producer and it was surrounded by the Chalco Lake. Later, they suffered the Spaniard evangelization by the religious order of the Augustinian friars who added the denominative “San Andres” and built several religious temples. The name Mixquic is composed by the Nahuatl etymology “mizquitl”, which is related to the mesquite and the postposition “C” which is translated as “in the”; altogether they convey the meaning “in the mesquite” or “place of mesquites”; however; it has been suggested that its actual translation comes from the Nahuatl word “miquiztli” which means death. 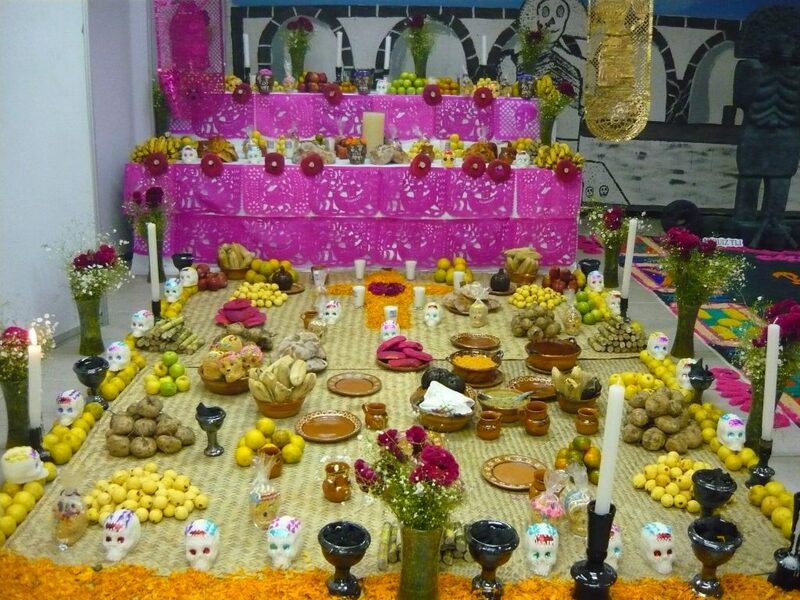 The Day of the Dead festivities in this region begins on October 31st with the placing of a table for the offering with food and allegories related to this tradition. On the 1st of November, at noon, 12 bell strokes announce the arrival of the children’s souls; the people fill the paths with white flowers’ petals, light a candle and offer them a prayer. On November 2nd a bell stroke announces the departure of the children’s souls and the arrival of the souls of the adults. Later, at 7 o’clock in the evening, an event called the “alumbrada” (“lighting”) takes place in the cemetery, where the tombs are decorated with flowers and candles in order to pay homage to the dead and show them the way. Finally, on November 3rd, neighbors exchange fruits, bread, and food to mark the end of this beautiful tradition. 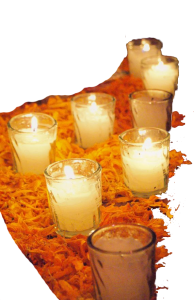 Offerings are an important part of the Day of the Dead celebration; these vary depending on the region. 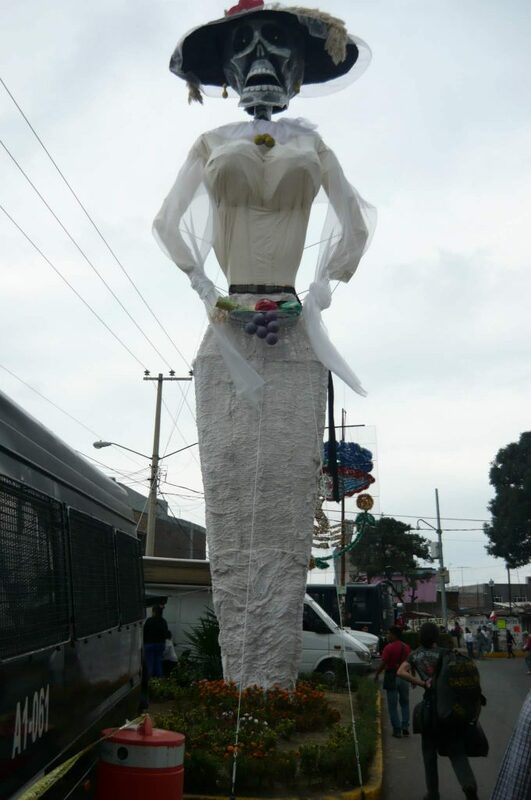 They contain flowers, candles, photos, crepe paper, vessels, plates, bottles, and food such as bread, tamales, hot maize drink, mole, candied pumpkins and tejocotes, cigars and alcohol, among other products that the deceased to whom the tribute is dedicated used to enjoy. 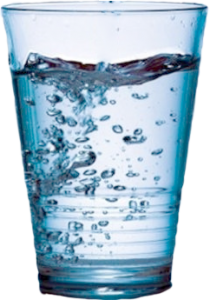 Water, which is offered so the souls can quench their thirst in their way to and from the other world. 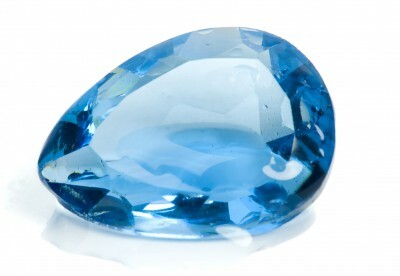 It is considered a source of life or purity of the soul. 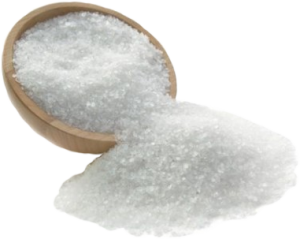 Salt, this is a purifying element that prevents the body from being corrupted and also manifests wisdom. The flame of the candles, which guides souls in their passage from life to death. It means light, faith, and hope. If the candles are purple, it is a sign of mourning, and if four of them are placed in the shape of a cross, they represent the cardinal points to guide the deceased’s soul to the right path. 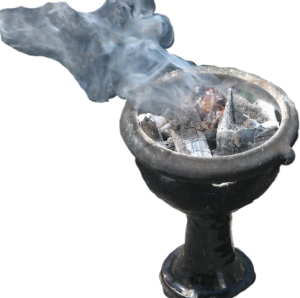 Copal or incense transforms and transmits the prayers or praises and it brought together the one who offers and the one who receives, it also drives away evil spirits. 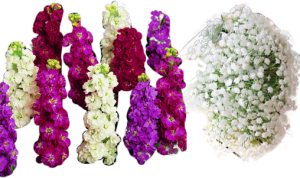 White flowers such as wallflowers and baby’s breath represent purity and tenderness which are associated with children souls. Yellow flowers such as the Mexican marigold mean wealth, and they are used to heal and preserve life. In many places, their petals are pulled off and they are used to indicate the path to the souls. 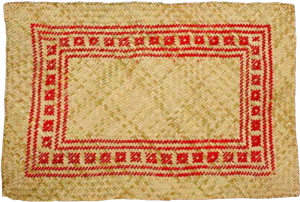 The petate (matting) is an object of rest. It is useful to put the offered food. There, toys can be placed for deceased children as an element of play; usually, they represent a Xoloitzcuintli or Mexican Hairless Dog which was thought to help the souls to cross the river that prevented the passage to the afterlife. 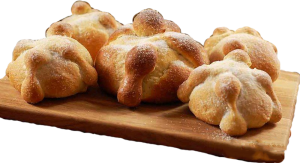 The bread, which is offered to the newcomers as a fraternal act of sharing, is made with strips that resemble bones (called shinbones) and a tear that symbolizes the human skull and which formerly represented the God of Death, Mictlantecuhtli. 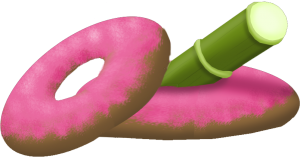 This bread can also be replaced by a doughnut or human-shaped bread, both decorated with red dyed sugar that represents blood. Golletes (bread with a tire shape) are placed on top of a cane; they represent skulls impaled in a sacrifice. A photo of the deceased, it must be hidden in such a way it can only be seen with a mirror to imply that s/he can be seen but s/he no longer exists. 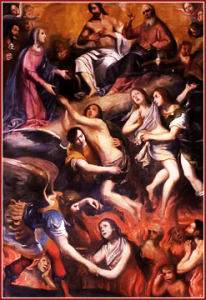 A painting of the Purgatory souls or a cross made of ashes to ask for the release of the soul of the deceased in case it was there. 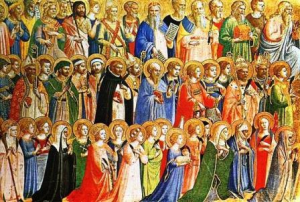 Images of saints that represent the good relationship between the living and the dead and also symbolize peace and the conviction to share. 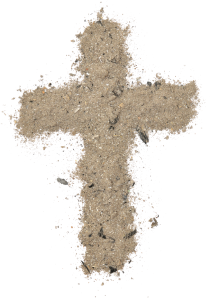 A large cross of ashes which helps the soul to atone for its pending faults. 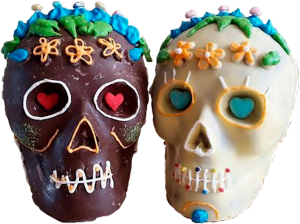 Medium sized sugar skulls that allude to the ever-present death, small ones are dedicated to the Holy Trinity and the big ones to the Eternal Father. 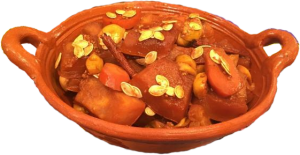 Food such as apples represents blood, and candied pumpkin, the kindness. Beverages such as liquor so the deceased can remember the events of his/her life. The hot chocolate color symbolizes the water s/he used to bathe and it is drunk to be impregnated with the essence of the deceased. Finally, the offering is divided into two levels, marked by the table and the floor which represent the heaven and the earth. 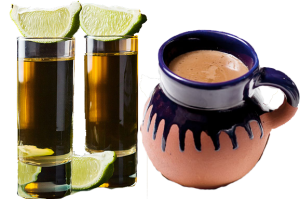 The images of the deceased and saints are placed on the table along with the water and fire elements, represented by liquids such as hot maize drink, pulque, water, etc. and by the candles. The elements such as the incense and myrrh, seeds and fruits that symbolize the air and the earth are placed on the floor (Suarez Lobato, 2010). During a tour in Mixquic, we wanted to find out what the allegories they used to decorate their tombs represented for some of the inhabitants of this region, so we conducted a short interview with two members of the Pineda family. 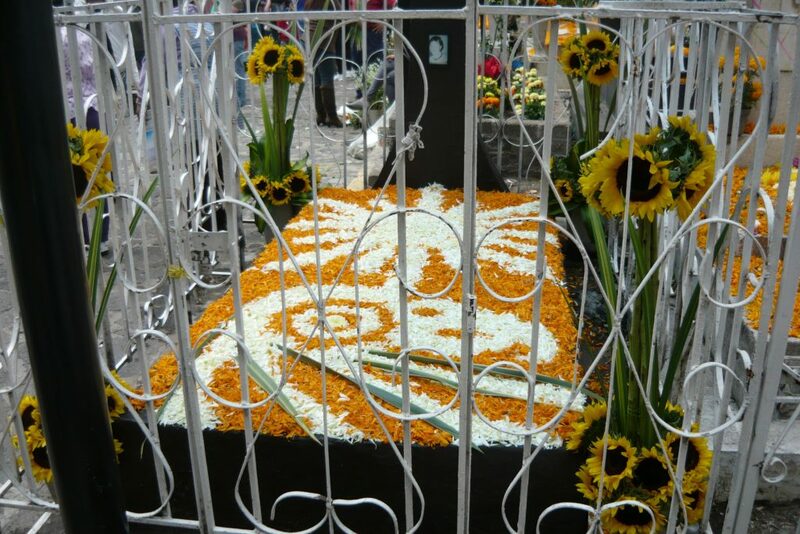 The offering was made with a mat of Mexican marigold petals, framed with pink and white marshmallows. Every inner corner of the frame had sweets in the shape of green pears with mint flavor. 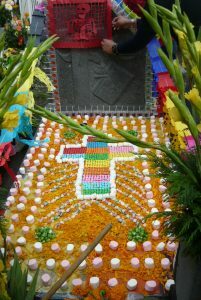 At the center of the mat, there was a cross made with colorful candy-coated chocolate buttons with white lines representing light flashes made with different flavor candies of the “Acuario” brand. 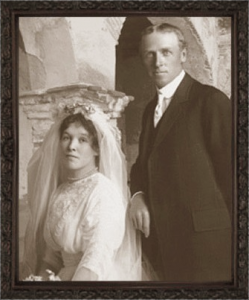 The tombstone was framed with lollipops and decorated with papel picado (“pecked paper”). There were also vases with gladioli and pine. In spite of the apparent, the offering was not for a child, but for a teacher of the Mixquic community called Salvador Pineda who had a great affection towards the children and a great vocation towards teaching. 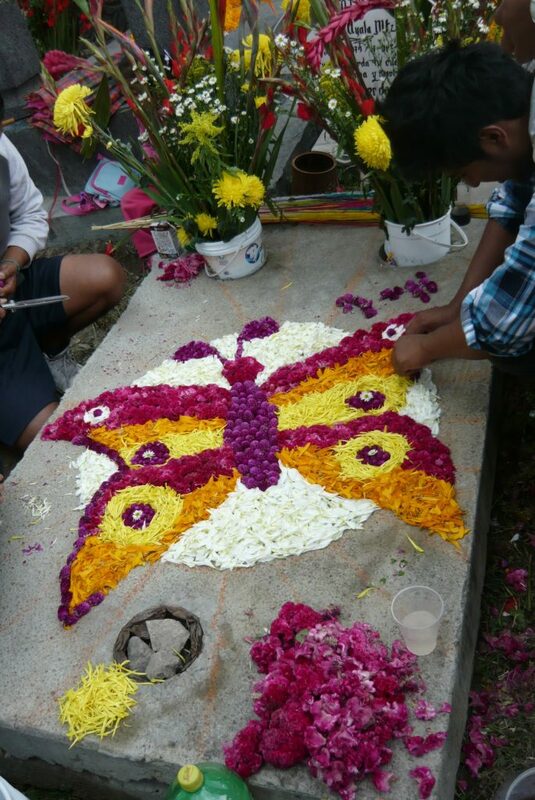 Teacher Pineda mourners said that he liked to be different, out of the ordinary, so they chose these elements to decorate his tomb and pay him tribute. 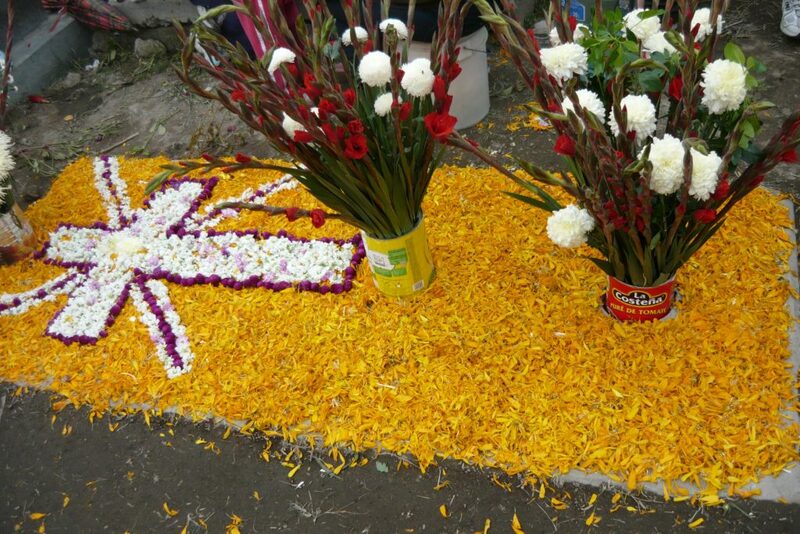 For Salvador Pineda’s relatives, making this offering is a way to remember and show him respect since they recognize his great work as a teacher which made him an important member of Mixquic. Also, they said that it is a way to celebrate with him, to enjoy life while it lasts. “It is dedicated to the father of the Pineda family, who was a well-known gentleman here in this locality, he lived there, in front (he laughs. )… With all respect and forward, right? With all respect and without it, Don Salvador. Comb your hair because they are taking your picture (He commented this because some National Geographic photographers were taking a picture of the grave. )… And I really believe that Mexico is the only country that apart from respecting the death is very irreverent against it. And if the death is a party, then what better than to do it as a party, right? To truly give it the color of a party and yes! I believe that in the pain, we remember… As they say “To the dead internment and to the living enjoyment”, so put your heart into it (laughs)”. 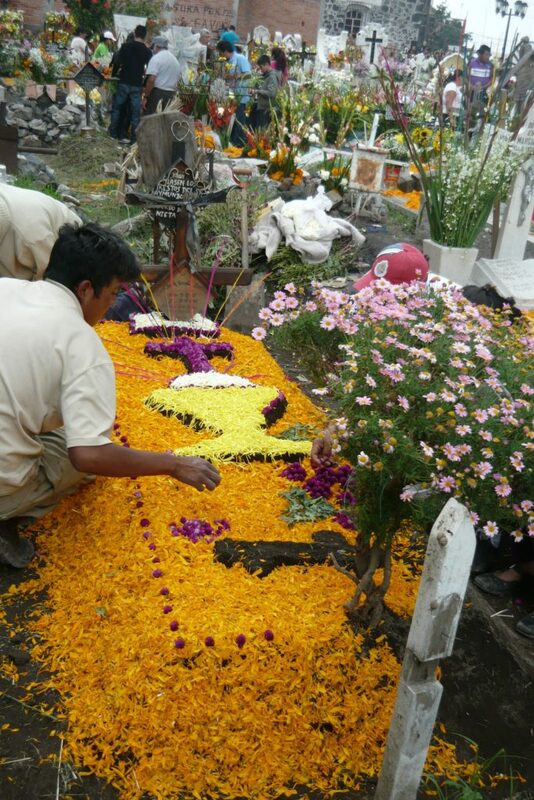 The uses and customs of the Day of the Dead in Mixquic and throughout Mexico are a melting pot of ancient traditions that are perpetuated through time but are also nourished by the social and cultural changes of nowadays. Death is still a symbol of respect, transition, and transmutation, which leads to a better life. It is a way to remember and respect those who were here before us, who leave us a source of wisdom, experiences that are longed with the nostalgia of these dates. 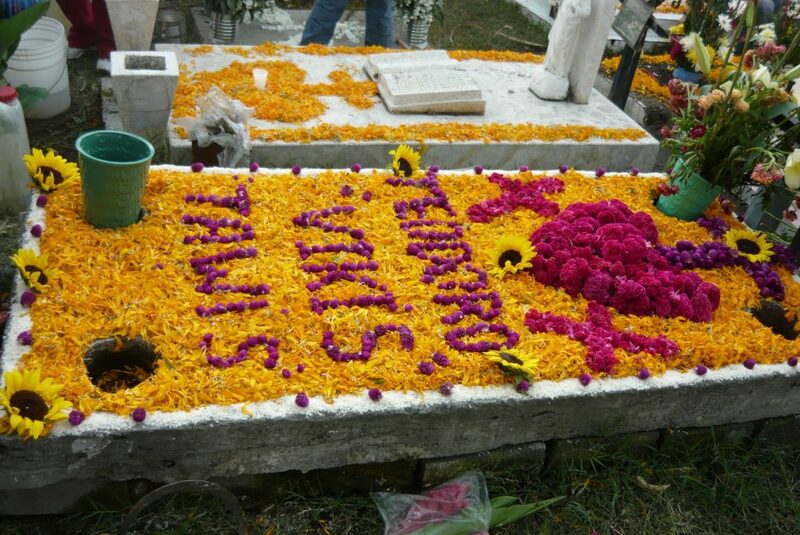 For Mexicans, death means not only solemnity but a means of enjoying with their ancestors; it is a way of saying “we are alive” and wanting to experience all that this life offers. 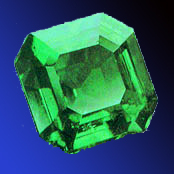 Suarez Lobato, D. O. (2010). El día de muertos en Pátzcuaro como muestra representativa de México (video story). (Unpublished bachelor thesis). Universidad Autónoma de México, México, D. F.